Cloud based accounting software enables you to perform all accounting processes online at anytime from anywhere. Cloud based accounting is also referred to as online accounting. Simply put, the accounting software is accessed using a browser and there is no need of installing the accounting software on your local desktop. It is just like we do internet banking or use any email services like Gmail, Hotmail or Yahoo every day. Cloud based Accounting software service providers such as NetSuite, Quick books, Zoho books, Sage intact, Multi View, Cougar Mountain Denali and such others host their accounting software in centralized servers which are housed in remote data centers. Both the software and the data are stored in the centralized servers. These Software are available as a service. All that is needed is a device such as PC, tablet or a smartphone and internet to access the cloud based Accounting software. Vendors offer annual Subscription, monthly subscription plans and pay per use flexible option to use the software. Users register themselves and login and start using the software. Such users are referred to as subscribers. 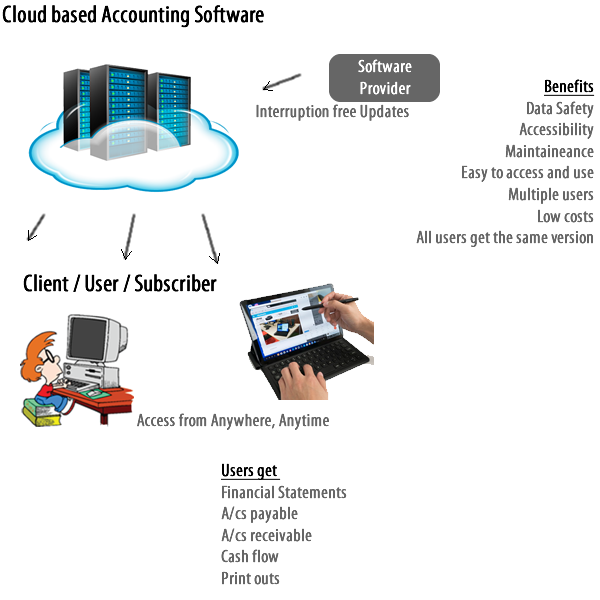 Cloud based Accounting software brings reliability, accessibility, security and cost benefits. All the benefits of cloud based software are available with cloud based accounting software also. Since the accounting data is stored in the cloud, anyone with proper authentication can create sales orders, track sales, create and send invoices, get cash position, Account receivables and accessing financial statements at anytime from anywhere. Another important benefit of cloud-based software everyone gets access to the same data. Cloud based accounting software providers continuously update their software and make it available to the subscribers. Subscribers can use the latest version of software with the upgraded features and reap maximum benefits without the hassles of installation. Since the cloud vendor directly handles the updates and upgrades, reliability is ensured. As the data is very sensitive in nature, software providers store and transmit data securely with 128-bit SSL encryption, providing high level of security. Further, all hosting providers offer automatic backup ensuring no data is lost. Organizations are very much concerned about their financial data. Cloud based accounting software store data in their own data centers. Since this data is in centralized location in secure environment, data theft does not occur. Only right people with logins can access the data. In natural disaster conditions, companies will not be affected because data is stored in multiple geographical locations. Cloud based accounting software provides ahigh degree of multi-level access to its users and so a large cross section of the organization employees can get rights to access the data. When we move to cloud based accounting software, we need not spend time and money to buy and set up the IT infrastructure to run these software. Many cloud-based Accounting software providers offer APIs using which we can integrate with other software. For instance, we can import data from accounting software to excel and format the data as required. There are hundreds of accounting software available in the world. Many are very sophisticated and are expensive to use. Luckily, there are many software for every ones budget. From startups, small business, to enterprises software are available to suit their budgets. Every software has a trial version available. There are many tools available to develop cloud based accounting software. One of the popular and most reliable is the ASP.Net core framework from Microsoft. The other popular programming tool is Java. When we use ASP.Net core, Web API is used to implement business logic. All the steps which are required to master accounting software using ASP.Net core tool is shown here. Previous Post How can we leverage Azure Functions and Service Bus Queues to enable background processing in an ERP application.